Fabre says the new Monte Carlo 5 was designed to appeal to the U.S. market. 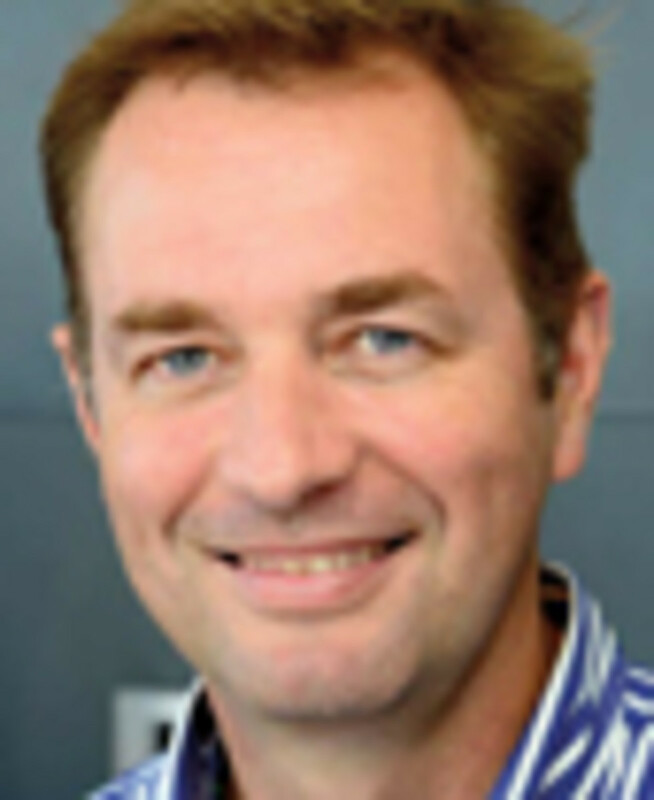 Laurent Fabre became president of Beneteau America a little more than a year ago. The 46-year-old native of France’s Brittany region grew up near the water and learned to sail before he began riding a bike. It had been his lifelong dream to work in the boating industry in the United States. Given his success in growing Beneteau’s powerboat presence in the rest of the world, it’s not surprising that he would find an opportunity to fulfill that ambition. His initial task in the U.S. was to grow Beneteau’s powerboat presence. Before the Swift Trawler 34 was available in the U.S., the company took it on the Great Loop in a marketing endeavor called “The Greatest Loop.” In a blog post, Fabre wrote, “Our intention is to demonstrate that a simple boat — 34 feet, single-engine — makes it easy, enjoyable and affordable to cruise the Great Loop.” It was endeavors such as that one that likely earned him his promotion to president of both the powerboat and sail sides. Soundings Trade Only asked Fabre to talk about the industry and what is giving the boatbuilder a competitive edge in a tough market. Q: You’ve had some time in your role as president. What have you accomplished so far, and what is your goal moving forward? A: I’ve been in this position for just over a year now. I came to America three years ago with my family to develop a strategy for the powerboats here in America, to recruit dealers and increase the brand awareness. We immediately had quite good success. I was promoted from sales and marketing manager for powerboats to president of powerboats and sailboats. Really our strategy here is to maintain our position of worldwide leader for sailboats and to gain market share in the powerboat business. We had a very impressive booth. We had two trawlers, three GTs, a Barracuda, the new MC5 and three Monte Carlos. So we had 10 boats and it looked really impressive. Four years ago, we had two powerboats and the sailboat. It’s definitely not the same company for the public. 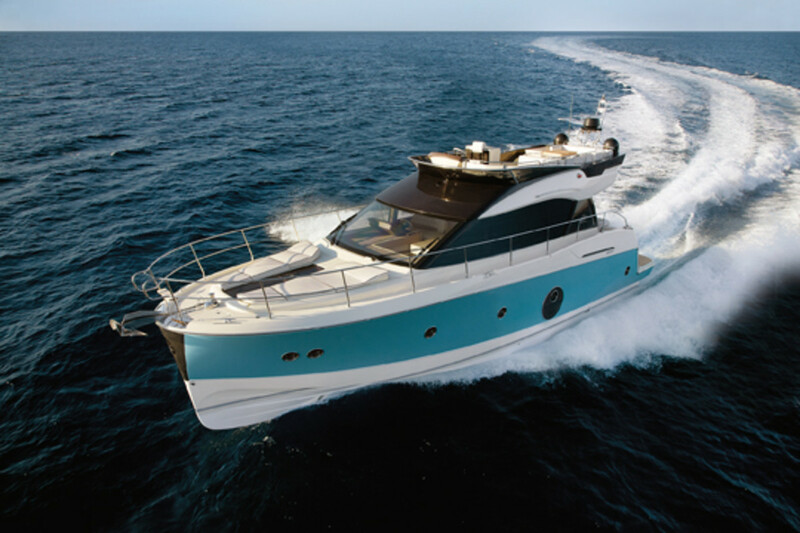 The Barracuda 9 Fly has been a mainstay of the Beneteau fleet since the 2012 Fort Lauderdale show. 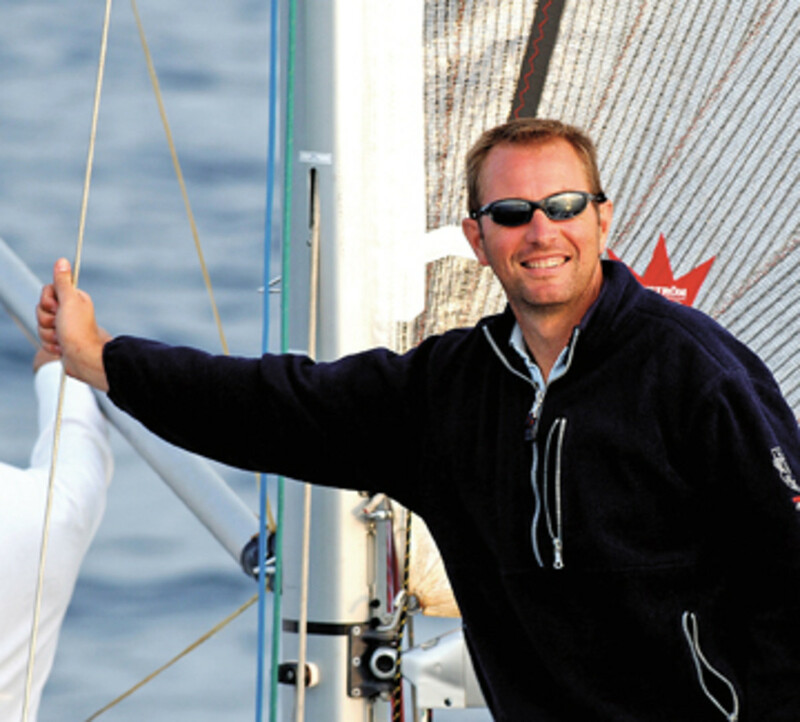 Q: Can you give me a bit of your background prior to joining the Beneteau Group and what led you to this point? A: I am a Buckeye. I graduated from Ohio State University because we had an exchange program with my business school in France. I earned a double degree, so when I got my French degree I also got my M.B.A. from Ohio State. My goal in life has always been to be able to work in America. For technical reasons you cannot really have a student visa transfer into a working visa very easily when you’re French, so I had to go back to Europe, and I actually started working for a French and American company, Steelcase. My first assignment was in England. I’ve been working in between England, Germany, France and America for 10 years for Steelcase, but my dream has always been not only to work in America, but also to work in the boating business. I’m from seaside — my whole family is from Brittany — and when I was given the opportunity to go back west of France and work for [French yacht shipyard OCEA] I immediately took the opportunity. We always had a sailboat in the family, and I learned to go sailing even before I learned to go biking. I have always been in love with sailing. After two years at OCEA, when Beneteau gave me a call and said, ‘We need somebody to develop some product,’ I thought, ‘Wow!’ When they told me it was to develop the powerboat activity, then I realized the real challenge. At that time Beneteau powerboat sales were probably 15 percent of the business, but the potential was huge. Today, sales of powerboats are 50 percent of the business. In actual numbers we probably make more powerboats than sailboats today. In the rest of the world, everybody knows Beneteau for both powerboats and sailboats. In America, we had such a strong position with sailboats and the market for powerboats is so fragmented, we never wanted to really come and try to market our powerboat brand here. There are so many special boats for skiing, sportfishing, offshore sportfishing, inshore sportfishing — we didn’t know where to start. But it appeared to us that because of the prices we could bring some nice products with a European touch that would sell. The dealers were looking for products that sell easily, so it was the right time to come. After 10 years of developing powerboat activity for the rest of the world I was given the opportunity to come to America. We actually made the decision pretty fast. We sent two people here, Maryline [O’Shea], the marketing director, and myself, and moved over my family with two kids. My son is actually studying in Montreal, and my daughter is still learning here. She learned how to speak American so fast she actually corrects my French accent. Anyway, here we are. We developed activity to 30 percent last year to add sailboats and powerboats together. And powerboats already account for one-third of our sales activity in America, which is huge when you consider that four years ago powerboats did not even exist for Beneteau here. Q: “The Greatest Loop” in 2012 seemed to really be successful in bringing attention to the Beneteau powerboat brand. The [Beneteau Toucan Dealer App by Jester Communications], which was developed here, was immediately awarded best electronic tool by the National Marine Manufacturers Association, and now all of Beneteau around the world is using it. It’s one of the greatest tools for the dealer network. Even today, when we look for a new dealer and we want to help them understand who we are we give them access for a restricted period of time to our dealer application. After two or three days they love it and call us back, saying, ‘It looks so easy to sell your product.’ And that’s exactly the way we approach our business. Our goal is just to make it easy to do business. For example, this year instead of having our worldwide dealer convention in France, to foster the American market and help create a dynamic, the top management accepted that we would have an American dealer conference instead of going somewhere in the world with everybody else. All the dealers from North and South America got together in San Francisco. 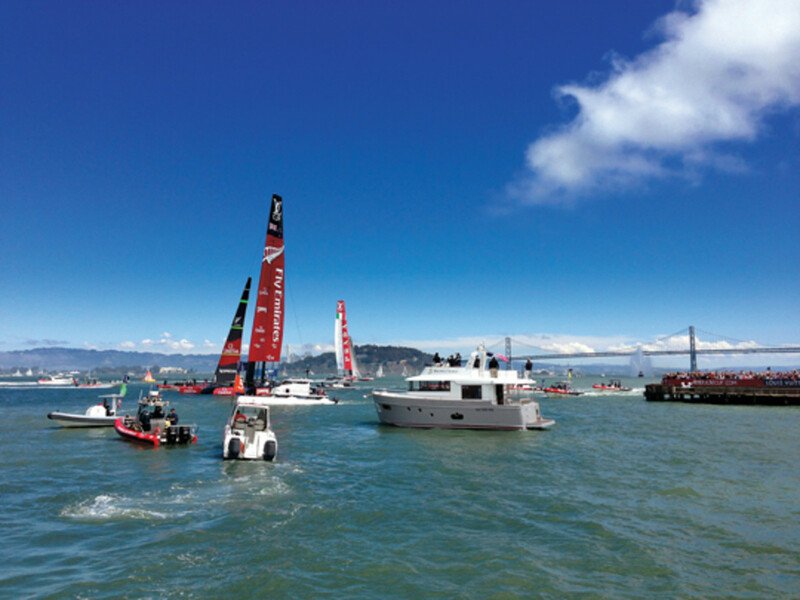 We had the idea of partnering with [America’s Cup USA] Team Oracle a year ago and we were hosted by Team Oracle to be the team’s hospitality vessel supplier. We took a few bets and we’ve been extremely lucky and it’s working out extremely well. So there have been a few marketing and sales initiatives like that and we are preparing a few more in the years to come. We feel the American market is huge and very dynamic. Q: It seems a trend since the American market is rebounding a bit more quickly than the European market. A: That’s for sure, but you see, I would have you look at it in two ways. A lot of European companies are looking for opportunities. A year ago, everyone was talking about China, Brazil, the U.S.A. and Canada. You see the trend has been focusing on America because all of the other markets have been suffering also. We have to be careful to distinguish the different companies between the ones that are looking for opportunities and the ones that write the strategy. It was decided as a strategic plan five years ago that we needed to go to North America for the powerboats. Sending me over with my whole family was a huge investment for our company. We were not looking at the American market as an opportunity, it was a strategic decision five years ago and implemented three years ago. I would say there is a really big difference between companies who just send a few more boats to the boat show and who send a few leaders here and there on a short-term basis, and companies like Beneteau who make the investment in their business decision and actually create a different branch with some autonomy, and make sure the new American branch actually has the power to also influence the design of the boats. That’s something that Beneteau really immediately decided to do. Fabre takes pride in the selection of Beneteau as the hospitality boat supplier for Oracle Team USA in its successful defense of the America&apos;s Cup in September. Our dealers give us constant feedback. You’re aware of the Base Camp system we have implemented (a system that networks Beneteau dealers, service technicians and management around the world in real time). Our dealers are constantly giving us feedback there, and the product people in Europe immediately read those comments as much as we do. They are on the same information system in Europe. I can tell you, with the upcoming products the American needs are fully satisfied and prioritized. And the new Monte Carlo 5 is really proof of it. In the first day of the Fort Lauderdale show we sold two boats. That’s the first boat we designed with the full description and the full functional brief coming from America. We even have a different layout for America and for Europe. It’s the first boat ever where we’ve done it like that. So yes, you can see there’s a trend, and there are a lot of people saying, ‘America is the place we want to be,’ but there is a big difference between trying to push boats to the American market and making the right investment to actually develop the business. Q: Beneteau seems to have a solid dealer network and seems to have a lot of efficiencies in place. Your dealers also seem to be genuinely passionate about the products. I’m thinking of one in particular that I visited — Cape Yachts. How do you foster that? A: I have to give credit to my predecessors. We’ve always involved our dealers in product development, and the fact that they are so excited and enthusiastic is because on the sailboat side Cape Yachts has always been involved in helping us make the right products. The fact that we have beyond 30 percent market share on sailboats is just living proof of the right implementation of our strategy. Now they are getting even more excited because they had a very good year on powerboat business and feel there is really the same dynamic. Maybe two years ago they didn’t feel as excited about the powerboat business because it was not developed at all for North America. They could have been afraid we would come with European product and ask them to sell those products. Now, after two years, our dealers know for a fact that we have the same strategy as in sailboats, and we are coming with American products for the American marketplace. Not only are they strong, good products, but they are a little bit different, so that makes them easy to sell. That’s what makes dealers really enthusiastic, when the products are selling and they don’t have so much to negotiate or justify because the people are coming to buy the products. If you look at the GT (Gran Turismo) 38 or the GT 49, that is exactly what has been happening over the last 12 months. People have been calling us looking at the Internet to find our products, and they come to boat shows, and those are the boats they’ve identified that they want to buy. I don’t want to name other brands, but we definitely are taking market share today. Q: Gaining market share with so many companies clamoring for the same-sized or bigger piece of an exponentially smaller pie seems tough. Do you think Beneteau’s sales approach plays a role in your ability to accomplish that increase? A: You know, I think one of the big differences in the industry is if you compare marketing strategies, you really have two opportunities. Either you can go for push or you go for pull. A push strategy means you are a very big manufacturer and you just push your boats into the dealer network. Because dealers are buying your boats, they have to sell them. The whole marketing strategy is giving discounts or incentives to the dealers to take your boats at a given time of the season, and then all year long push one more boat down your dealer network. The pull strategy is, on the contrary, to advertise your products in magazines, on the Internet or at shows, to create a demand from the end user. Then because there’s demand for your product the dealers want the opportunity to represent your brand. So they come and buy your product. Of course, any efficient sales and marketing strategy is using push and pull together because there’s no magic recipe. But I think, given our budget — and we definitely have a limited budget because of the whole situation in Europe and also because here we are still accounting for a few hundred boats, compared to the thousands that we are manufacturing and selling worldwide — you get even more clever about the ways you are spending your budget. Definitely the 34 going on “The Greatest Loop” was a pull strategy. It surprised even us how successful that operation had been because of how much brand awareness we got. That’s where really we’ve probably been acting a little bit differently from the rest of the industry. You can still see at the boat shows that the big manufacturers — I’m not just talking about the American manufacturers, but the European ones, too — when they’re not reaching figures they were shooting for, even after just two days of the boat show, suddenly you can see more discounts and incentives to the dealers. I think this is really not spending money in the best way. It is a really short-term push strategy, and you will not gain the right brand awareness and right positioning for your brand by doing that. I feel if you do that, there is a price. With a lot of changes of management in different companies during the last five years we have seen five years of very short-term strategies being applied. How many times have we heard recently a company going into some new niche market, like ski boats, or flat-bottom boats, or the jet propulsion boat, only to hear a few months later that they were giving up that new product development? I think the accumulation of short-term strategy and pushing the network to keep the best dealers or to sell more boats in their program is helping only short-term, but creating much more tension on the brand and more tension with the dealers and increasing the cost of the operations for the big companies. Q: Beneteau is taking market share in a segment that, from my impression, has higher margins than other areas. Is that the case regarding margins? How is Beneteau growing in this highly sought after and shrinking part of the industry? A: The markets we’re considering, either the sailboat market or the powerboat market beyond 30 feet, if you refer to different indexes or studies in the industry, they have been pretty flat for the last two years and were decreasing in the years before. And still we are announcing growth rates of 20 percent both in power and sail. I’m not talking about the outboard or aluminum powerboat segments, or pontoon boats, which are giving the feeling to everybody that our industry is going up, but those are very specific markets. If you are looking at the fiberglass beyond 30 feet, that market is extremely difficult and very competitive still. I would agree with you that the larger the boat, usually the larger the margins for the manufacturer, although if you’re looking at small boats, which are extremely consistent and very industrialized with very few options, the margins at the end of the day are really comfortable, compared to a trawler 44 or 50, which you had to customize with different colors and fabrics. Because of the crisis, that volume is very difficult to predict, so the industrialization of that boat is difficult to maintain. When you’re sending a boat to China, and a boat to America, and to Brazil, one in Europe, all the electric and engineering and sometimes the product definition, because of different regulations, has to change from one boat to the other. At the end of the day, although the margins on paper should be better for the manufacturer, they may not be that comfortable. Technically, with the tough competition we are experiencing, all of the margins are not what they used to be in every segment. We are taking share on sailboats and powerboats because of the fact that in the last five years Beneteau has decided not to reduce the investment on innovation despite the recession. Our rhythm of launching new products, new ranges, innovative features has not decreased for the last five years. And when I’m talking about a new boat, it’s a new hull design coming with a new deck and very innovative features, such as the Air Step. If you look at the innovative design of the MC5 you will realize that with its very modern engines and radical propulsion system, we managed to reach 30 knots on a flybridge boat, where most of our competitors are at 26 or 27 knots, and this is because we really look for the best engineering and the best way to reduce the weight and improve the structure, the best way to reduce the noise and still improve the propulsion, and still offer different solutions to different countries. And I think the market acknowledges that. You cannot fool the customers anymore by painting your hull in a different color from one boat show to the other or extending the swim platform and changing the name from the 36 to the 39 and pretend you have a new boat. It doesn’t work that way anymore. Q: I remember you addressing this topic at an event at a 2012 FLIBS panel discussion called “The Tide Is Turning.” The title of your presentation was “The Tide Has Already Turned” and you really hit on some of the basic ways that buying habits have changed. How does this new discerning customer play into the evolution of the industry and how does it change the way you sell today? A: The customer is much more educated because he has many ways to compare product. The customers all want to be smart in the way they’re buying, and they have many tools to get smarter every day. The good old days of the traditional broker being more knowledgeable than the customer doesn’t work anymore, first because a lot of the brokers are aging. They did not even test-drive all of the boats they sell because they represent too many brands and are not knowledgeable about everything that’s happening in the industry because innovation is coming from propulsion, from electronics, from hull design, from new cameras, from new maps and satellites and those guys cannot make the investment to be trained on everything they would like to sell. 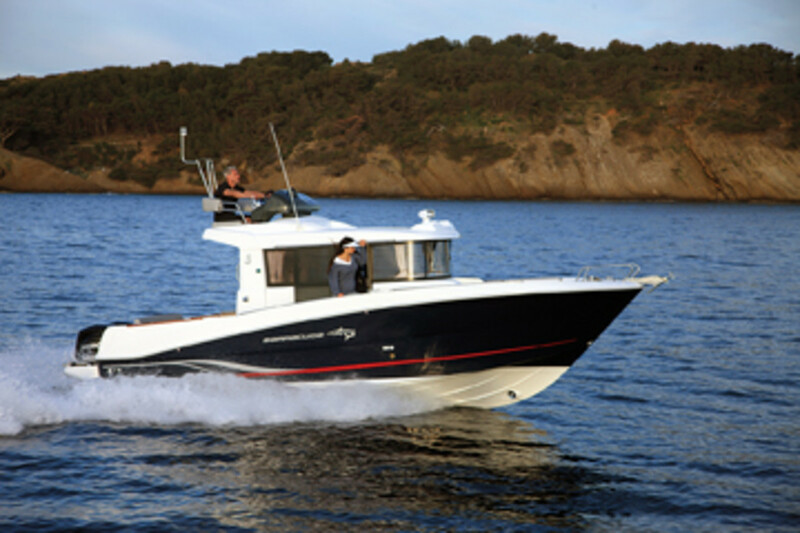 That’s why Beneteau developed … the perfect model of going into the market. We are asking our dealers to be dedicated. I wish I could say exclusive. In the rest of the world we ask our dealers to be exclusive. Here in America, I don’t think we have a product range wide enough to demand that they are exclusive. But definitely the people we are training, we ask them to be fully dedicated, and then we train them. And when they are trained, we train them again. And when they think they know product, they take tests. We have a Web-based platform of training called Eureka that our dealers have to go through, and they have to obtain a certain score before they can actually come and work the boat show with us. It’s only when we know they understand the features of our products that we know it will be very comfortable selling our products. We feel, particularly on the trawler side, that some customers are still more knowledgeable about our products than our own salespeople, even after training. They’ve been reading everything they could find before they will buy a boat. That is acceptable as long as salespeople know what they’re talking about and they also know what they don’t know. That’s something we really insist on. When you think the customer in front of you is testing you and he is challenging you, it’s much better to tell him you don’t know and you will check, rather than pretend and give a fake answer. Then you lose the trust of your customer. We think we are aware of how things have evolved and what customers are looking for, and this has really changed the way the dealer should behave. Today customers want to buy fun on the water. They don’t want to worry or don’t want their boat to be a source of trouble. We are insisting more and more on training of technical people, of the knowledge on the technical side to make sure all of our customers are happy when using their boats. Beneteau in America is one of the first brands to partner with VesselVanguard because we believe this is a service that will bring peace of mind to the customer. It’s an information system that will tell you at any given time what the maintenance is that you need on your boat soon. When there is a need, like changing the filter or the oil, you will get a message generated by Beneteau, and so will the dealer. The dealer will be in the perfect position to offer the customer to go and perform the service. We believe it’s by investing in those services that we will satisfy our dealers and our customers and gain market share. Q: Those types of systems seem win-win because one of the biggest challenges I hear service managers cite is getting customers to do regular maintenance. Maybe that was a very lucky period of time, but that was wrong. The few dealers or brokers waiting for that to happen again, I keep telling them times have changed and that will not happen again. It’s up to us to develop right services and develop the right approach because our customers are still there.